MOSCOW — I wanted to better understand President Trump’s America, a place where truth is being ripped from its moorings as he brands those tasked with lashing it back into place — journalists — as dishonest enemies of the people. So I went to Russia. It was like a visit to the land of Alternative Truth Yet to Come. But it also gave me a glimpse into how our new national look is playing in the global information war, where competing narratives are clashing along a sliding scale of fact and fiction. I had picked a ghoulishly perfect week to swing through President Vladimir V. Putin’s Moscow, where spring was struggling to break out over the low-slung, slate-gray cityscape. Mr. Trump had just ordered a Tomahawk strike against Syria’s Shayrat air base, from which, the United States said, President Bashar al-Assad of Syria had launched the chemical weapons attack that killed more than 80 and sickened hundreds. As soon as I turned on a television here I wondered if I had arrived through an alt-right wormhole. Back in the States, the prevailing notion in the news was that Mr. Assad had indeed been responsible for the chemical strike. There was some “reportage” from sources like the conspiracy theorist and radio host Alex Jones — best known for suggesting that the Sandy Hook school massacre was staged — that the chemical attack was a “false flag” operation by terrorist rebel groups to goad the United States into attacking Mr. Assad. But that was a view from the fringe. Here in Russia, it was the dominant theme throughout the overwhelmingly state-controlled mainstream media. On the popular Russian television program “Vesti Nedeli,” the host, Dmitry Kiselyov, questioned how Syria could have been responsible for the attack. After all, he said, the Assad government had destroyed all of its chemical weapons. It was the terrorists who possessed them, said Mr. Kiselyov, who also heads Russia’s main state-run international media arm. That teed up Mr. Putin to suggest in nationally televised comments a couple of days later that perhaps the attack was an intentional “provocation” by the rebels to goad the United States into attacking Mr. Assad. RT, the Russian-financed English-language news service, initially translated Mr. Putin as calling it a “false flag.” The full Alex Jones was complete. When Trump administration officials tried to counter Russia’s “false narratives” by releasing to reporters a declassified report detailing Syria’s chemical weapons stockpiles — and suggesting to The Associated Press without proof that Russia knew of Mr. Assad’s plans to use chemical weapons in advance — the Russians had a ready answer borrowed from Mr. Trump himself. It was the best evidence I’ve seen of the folly of Mr. Trump’s anti-press approach. You can’t spend more than a year attacking the credibility of the “dishonest media” and then expect to use its journalism as support for your position during an international crisis — at least not with any success. While Mr. Trump and his supporters may think that undermining the news media serves their larger interests, in this great information war it serves Mr. Putin’s interests more. It means playing on his turf, where he excels. Integral to Mr. Putin’s governing style has been a pliant press that makes his government the main arbiter of truth. While talking to the beaten but unbowed members of the real journalism community here, I heard eerie hints of Trumpian proclamations in their war stories. The government here doesn’t make threats like that. Things just happen. That was the case last year at the independent media company RBC after its flagship newspaper reported on sensitive financial arrangements of members of Mr. Putin’s family and his associates. The Russian authorities raided the offices of its oligarch owner, Mikhail Prokhorov. Within a few weeks its top three editors had left. Mr. Porokhov is considering selling RBC to another oligarch who is closer to the government, the Russian business journal Vedomosti reported on Tuesday. TV Rain has its own hard-luck tale. It was Russia’s only independent television station. 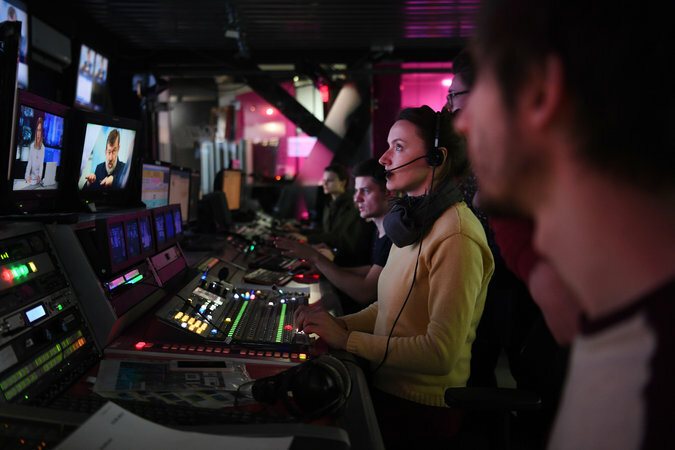 Carried mainly on cable, it regularly covered anti-Putin protests and aired voices excluded from the rest of television. But after it ran an online poll asking whether Russia should have abandoned Leningrad to the Nazis to save lives — deeply offending Russian national pride, and receiving a public rebuke from Mr. Putin’s top spokesman — its landlord evicted it and its cable carriers dropped it. Despite steep challenges, people like Mr. Badanin are still battling on. Their journalistic spirit couldn’t be killed, even after some of their friends and colleagues had been. One newspaper here, Novaya Gazeta, has lost five reporters to violence or suspicious circumstances since the turn of the century. Toward the end of the week, I went to its spartan offices in central Moscow to visit its longtime editor, Dmitri Muratov, who has fiercely guarded the paper’s independence through all of the killings and the crackdowns. 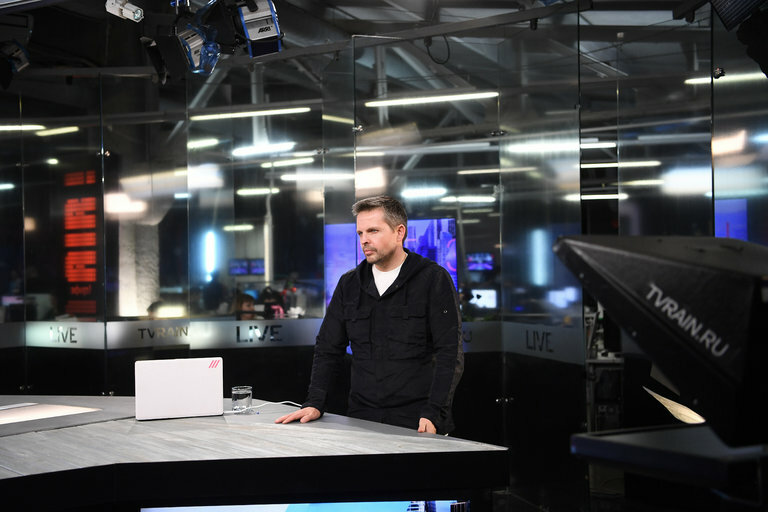 With the gallows humor of a seasoned journalist, Mr. Muratov was in a jovial mood and told me that he was getting a great kick out of state media’s hard turn against Mr. Trump. There’s a lot of speculation in Russian media circles about why the Kremlin allows Novaya Gazeta to continue to operate. That, and a loyal subscriber base of more than 240,000, help insulate it from outside pressure, if not the violence. The very day of my visit, Mr. Muratov received a threat against his entire staff from religious leaders in Chechnya, angry over articles about anti-gay violence in the region. The Novaya Gazeta offices are scattered with reminders to take such threats seriously, like the case that holds the dusty desktop computer of Anna Politkovskaya. She was shot dead in her apartment building in 2006 after exposing human rights abuses in Chechnya and writing unflinchingly about Mr. Putin. Mr. Muratov follows the American news media closely. I asked him what he thought about the American press corps’ quandary when it comes to covering a president, like Mr. Trump, who trades in falsehoods and demonizes journalists. He seemed put off by the question; the answer, to him, was so obvious. It’s a lesson American reporters should have learned long before Mr. Trump came along, especially after Iraq. Journalists in Russia like Mr. Muratov haven’t lost sight of that lesson because they can’t afford to. Neither can we. What’s going on in Russia is a clear lesson for us. It may take years for the U.S. media to regain some acceptance by Trump’s supporters. If at all.